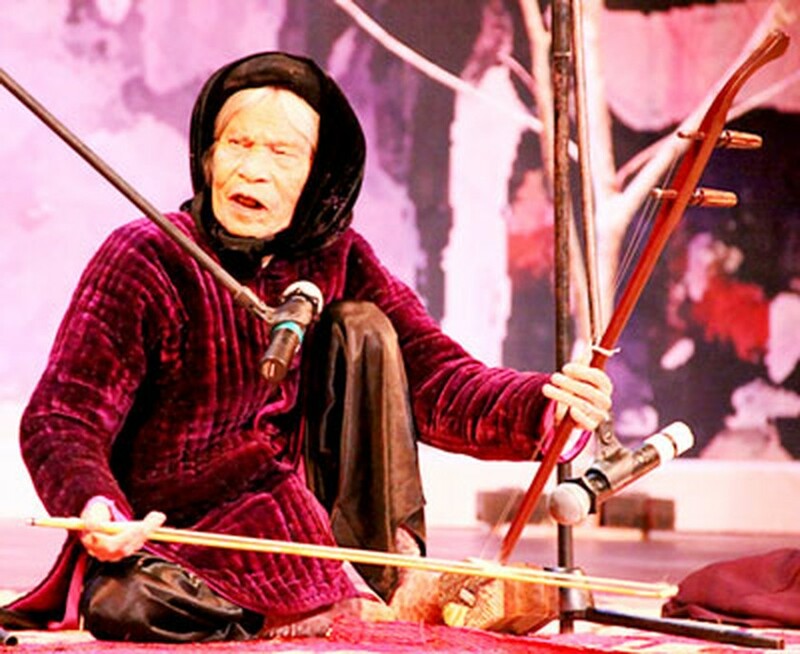 After a long illness, the last surviving artisan of Xam singing in Vietnam--85-year-old Ha Thi Cau, died in her private home on March 3, and will be buried in her homeland in Yen Mo District in the northern province of Ninh Binh on March 5. Ha Thi Cau (also known as Ha Thi Nam) was born in 1917 to a family in Y Yen District in Nam Dinh Province that has seen Xam singing for three generations. Xam singing is a type of Vietnamese folk music which was popular in the North of Vietnam and generally performed by blind artists who wandered from town to town to earn their living by singing. 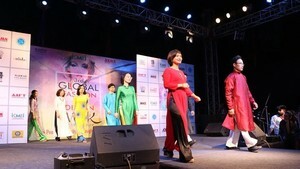 The melodies of Xam are borrowed from different types of Vietnamese folk music and themes of Xam songs are often drawn from popular stories, poems and legends of Vietnam. In singing Xam, the artists often play a monochord instrument or Erhu as a self-accompaniment. Sometimes they form a band in which one artist sings while others play traditional instruments. As a child, Ha Thi Cau moved with her family to Quang Phuc Town in Yen Phong Commune of Yen Mo District in Ninh Binh Province, and wandered the countryside markets and Hanoi with her parents performing Xam to earn a living. Losing her father at a young age, she and her mother joined the Xam troupe of Master Chanh Truong Mau, who owned six troupes at that time. She married Chanh Truong Mau later, to become his eighteenth wife and had seven children, four of whom died of smallpox. Since 1977, she took part in many national cultural festivals and won various awards as she was the only doyenne in Vietnam who was able to perform most of the Xam melodies. She was in charge of organizing a cultural program to celebrate the success of the Fifth National Party Conference in 1981. Ha Thi Cau received a commendation from Voice of Vietnam in 1998 and the special award ‘Ninh Binh Cheo Artisan’ at the Cheo Festival that year. In 2004, she was given the title ‘Vietnamese Folklorist’ by the Association of Vietnamese Folklorists and the title ‘Outstanding Artist of Vietnam’ by the government. She also received the Dao Tan Award in 2008 for her valuable contribution in preserving Xam singing. According to Prof. Hoang Chuong, director of the Center for Preservation and Promotion of National Culture, it was not easy to book the singer, who often did not have the strength to last through an entire performance. At her last performance in January 2012 at the Xam Ha Thanh Club, she replayed the song that brought her fame--‘Theo Dang Tron Doi’ (Following the Party to Eternity). Her life story has been made into a documentary called ‘Xam Do’ (Red Xam), directed by Luong Dinh Dung. Due to her severe ailment, she was not able to recognize many people since the beginning of 2013. Many of her students came to visit her, but could not talk to her anymore. According to Director Dung, towards the end she only opened her eyes for a very short time, saying something softly which could not be heard, and then lapsed into unconsciousness. In spite of effort of many doctors, she passed away at 12.30pm on March 3 at her home. Even though she was a renowned artist, she still led a frugal life till her last day, living with her daughter’s family. Director Dung commented that she had led a frugal yet devoted life. Living on mercies of others since young, she had never stopped loving Xam singing and her task of teaching Xam to the younger generations, said Dung. Even on the last day of her life, she still worried about who would continue her task of teaching Xam melodies. Since her death on March 3, her students and relatives have continued to pay there respects to her and escorted her to the graveyard in Yen Mo District of Ninh Binh Province.